Rumah Sakit Umum Pusat Dokter Kariadi Semarang - RSUP Dr Kariadi Semarang or commonly abbreviated as "RSUP Dr Kariadi" is a major Government-owned hospital in the Province of Central Java. 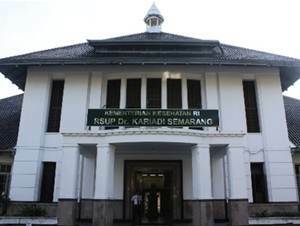 RSUP Dr Kariadi is domiciled in Semarang, the capital city of Central Java. Its legal domicile in Jl Dr Sutomo No 16 Semarang. RSUP Dr Kariadi is the Class A Hospital and has a functions as a referral hospital for the region of Central Java. RSUP Dr Kariadi operates directly under the Government of Indonesia through the Directorate General of Health Effort Care of the Ministry of Health Republic of Indonesia. 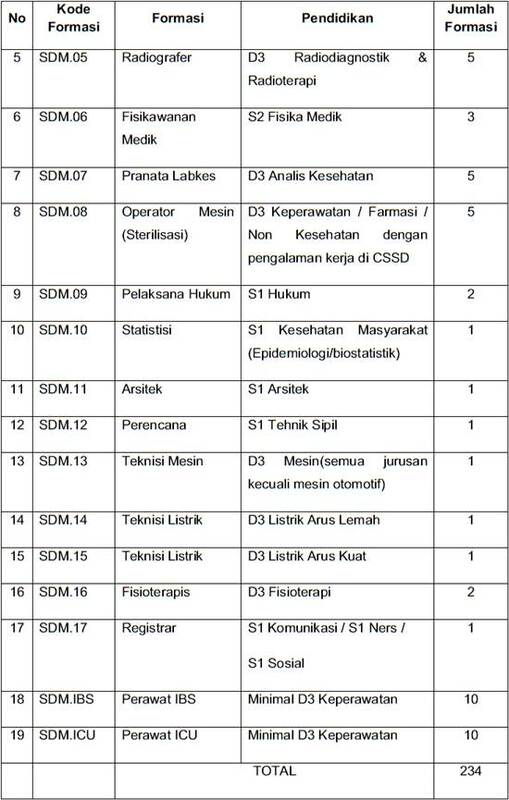 The Hospital also affiliated with the Faculty of Medicine Diponegoro University (FK Undip). According to RSUP Dr Kariadi's profile as cited by JobsCDC.com, RSUP Dr Kariadi was first established in 1925 as a Dutch Hospital under the name Centrale Buzgerlijke Ziekewsichting (CBZ). The name of RSUP Dr Kariadi was officially launched in 1964. RSUP Dr Kariadi now has 967 installed beds capacity, including 2 president suites, 13 VVIP, 103 VIP, 9 main beds, 106 Class I, 139 Class II, 519 Class III, 32 isolation, and 44 intensive. As of January 2014, RSUP Dr Kariadi employs more than 3,639 direct employees, comprise of 1,675 PNS and 986 Non PNS. D3 : minimum age of 20 years and maximum age of 35 years old. S1 : minimum age of 22 years and maximum age of 35 years old. Possess academic certificate/diploma with minimum accreditation B, issued by a state or private educational institution (PTN/PTS). Willing to be stationed in Semarang. Strong academic results with cumulative grade point average (GPA) ≥ 3.00. Minimum height of 155 cm (Female) and 160 cm (Male). Ideal of weight/proportional and attractive appearance. Not in a state of pregnancy at time of registration as evidenced by the laboratory test results (for Female applicants who has been married). Passed in all selection process; administrative, performance test, written test, psychological test, skill and interview test, and medical test. Never sentenced to prison or confinement under a court decision and already has permanent legal force, as an act of criminal. Never engage in an activity / movement against Pancasila, the 1945 Constitution, the State and the Government of the Republic of Indonesia. Willing to obey all the rules that exist in RSUP Dr Kariadi, and could not smoke during work in RSUP Dr Kariadi. Minimum 2 years of experience at IBS hospital. Possess certification in operating room nurse training. Minimum 2 years of experience at ICU. Possess certification in ICU nurse training. JobsCDC.com now available on android device. Download now on Google Play here. Please be aware of recruitment fraud. The entire stage of this selection process is free of charge. RSUP Dr Kariadi Semarang - Recruitment D3, S1, S2 Staff Non CPNS RSUP November 2016 will never ask for fees or upfront payments for any purposes during the recruitment process such as transportation and accommodation.